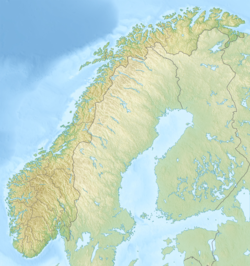 Ovrejaevrie (Southern Sami) or Orvatnet (Norwegian) is a lake in the municipality of Røyrvik in Trøndelag county, Norway. The water from the 4.9-square-kilometre (1.9 sq mi) lake flows out through the river Orelva into the lake Namsvatnet. This lake lies within Børgefjell National Park, less than 250 metres (820 ft) to the west of the border with Sweden. ^ "Orvatnet" (in Norwegian). yr.no. Retrieved 2011-09-13. This page was last edited on 3 March 2019, at 21:34 (UTC).